In 2014, 541,000 Americans finished running a marathon – an all time high. This past year several dozen of my acquaintances have also completed marathons. (They all say this bestseller – Born to Run – inspired them.) My facebook feed is on the weekends often nothing but finishing lines and bib numbers and hash tags about soldarity, perseverance, and the glory of marathoning. I am super happy for my friends. Don’t get me wrong. I think – if my friends and the half a million other people who run marathons are happy and healthy – that their perseverance, their accomplishments, and their resulting pride and joy are super awesome. I just will never be one of them. Perhaps it goes without saying, but probably the main reason I won’t be running a marathon any time soon is that I don’t like running. Sure, the sense of accomplishment might be nice, but the actual act of running itself doesn’t give me the pleasure it seems to be able to give some of my friends. Now, the reason I brought this up is this that, unfortunately, I think a lot of people who run, or who aspire to do marathons, are like me. They don’t like running. They simply think that they should like running, or maybe they shouldn’t, but they do it anyway. Usually this is for the sake of weight loss. Sometimes it is for feelings of social validation, or self-worth. If you are one of these people, that is, if you don’t like running but force yourself to do it, I ask you to reconsider. Perhaps think about accepting yourself and your pleasures as they are, and seeking another activity that you enjoy. If it needs to be an activity chock full of challenges or with a high degree of social acclaim (as marathons are), you can still find that in pretty much any sport. Meet Up groups and at your local gym are great for finding communities for cycling, for rock climbing, for dance, for pilates, for yoga, for kayaking, or for whatever other activity feels right for you. Even if I enjoyed running, I’m not sure that I would want to subject it to long distance runs on a regular basis, and particularly not over an extended period of time. 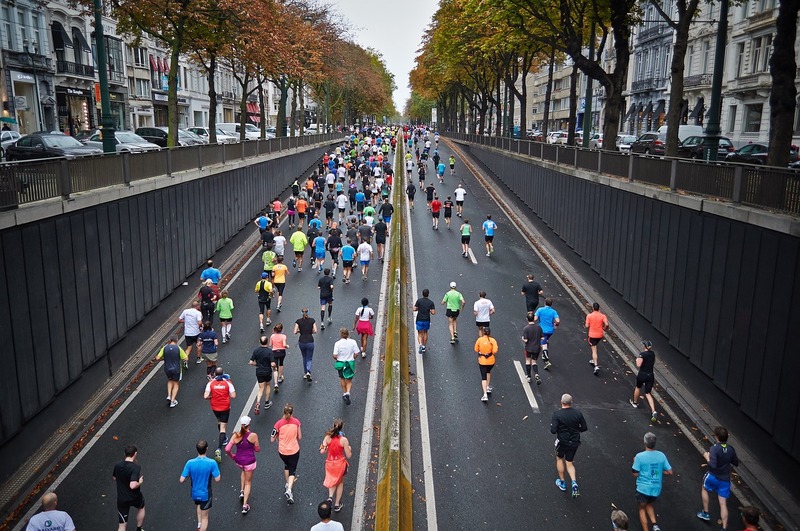 While the panic over cardiac arrest and death as a marathon runner appears to be slightly overstated (that is – it seems as though most people who suffer deaths as runners already have underlying cardiovascular disease) – running can still cause stress on the body. Exercise requires the secretion of the stress hormone cortisol. Cortisol spikes are fine in short bursts. If you elevate them chronically, as people do with long distance running and especially if doing it multiple times a week – then it can become a serious problem. Chronically elevated cortisol is associated with immune system dysregulation, an impairment in fighting off diseases, chronic systemic inflammation, digestive issues, IBS, leaky gut, heart disease, hypothyroidism, anxiety, and depression. This is a serious concern for all people. Women, however, have one yet greater set of concerns: the hormonal response to running. The female body can get pregnant. But if it gets pregnant at a time of famine or stress – then it is at a much higher risk of dying than it would be otherwise. Pregnancy is a highly demand period of a woman’s life and the body takes this very seriously. In order to prevent you from becoming pregnant at the wrong time, the female body developed an ingenious trick: it shuts down reproductive function in response to stress – both physiological and psychological. This means that hormone production shuts down, thyroid function slows down, and fat burning slows down. Without healthy hormone production, you can suffer symptoms such as adult acne, low libido, poor sleep, mood swings, depression, anxiety, and weight gain. Because this is important to note – not only does the body want to stop you from starving, but it is also going to try to hang on to as much fat as possible. The more you over-exercise (read this post to find out if you overexercise), the slower and slower your metabolism will get. Your thyroid production will slow. This causes weight gain, but can also cause fatigue, brittle hair and nails, and feeling chronically cold. Of course – if you are a chronic long distance runner – and you love it – you can most likely help prevent yourself from suffering from these things. You can make up for this by making sure you eat plenty of calories and plenty of carbs, and especially after your long runs. Marathons take time. They take effort. They take commitment. They take gusto. They take physical exhaustion. Unfortunately, we all have a limited amount of energy to expend. And this energy comprises all the kinds of energy we could expend – mental, emotional, physical. We are creatures with a gas tank, and we have to use it sparingly, making sure that we don’t overuse the gas until we are running on fumes, and stuck that way. These days, I simply don’t have an abundance of emotional energy. I spend so much of my life and time doing other things, such as working, writing, dancing, and teaching dance–not to mention managing my dysfunctional kidneys and the stress associated with that–that I simply do not have the emotional reserves to undertake such an endeavor. Nor do I anticipate I will ever do so. I don’t feel the call to engage in this public challenge the way so many other people do. I simply feel emotionally demanded of and called elsewhere – so that is where I shall go. If you are unsure about running a marathon, I invite you to be okay with that, too. And with that – I bring my list of reasons I will never run a marathon to a close. I know it’s a short list – but they are all very important and I think very deep points. I am curious about your own relationship with running and with marathons. Did you have any health setbacks while running? Any emotional struggles? Or do you love it and can’t wait until your next marathon? I’d love to hear all about it! Don’t forget that I have absolutely nothing against marathons for other people… they’re just not for me! loved this post! these are my reasons as well. i would never run a marathon though i am sure people really do love it. I love running, especially long, slow runs on a beautiful day. Running allows me to enjoy nature, clear my head, and feel recharged. I loved marathon training — the sense of accomplishment of following the plan and hitting the targets. Yet, of the 5 marathons I completed, I absolutely hated 3 of them, loved the trail marathon, and loved most of the NYC Marathon until the last few miles merely because it was NYC Marathon. I will not do another marathon, though I continue to do plenty of half marathons and shorter distance races as well as obstacle course races. Did I feel that marathoning was healthy? Not particularly, and I was very careful to eat well and rest during the intense weeks of training. These days, I still run, because I love it, but I do a fair amount of weight training and obstacle specific training. I pay attention to what my body says for the most part, which can be difficult sometimes. It takes a lot of practice to analyze the body’s cues and to follow them. Basically, find what you love and do it. I know a lot of people who don’t like running, and I don’t see any reason why they have to run. People tell me I should do a triathlon, and I just don’t want to, so I won’t. Same idea.